In this issue: Mercaris Trade Data Review: What Imports Reveal About Organic Supply in the U.S.
Mercaris Price Preview: What Trade Data Reveals About Organic Supply in the U.S. This month we preview the Mercaris Report on U.S. Organic Imports, slated for release this September. The Report provides key information on imported supply of organic crops. Our subscribers will be able to access the Report via our website, and use it to track monthly, quarterly or yearly volumes of organic imports and exports, as well as foreign ports of origin/country of origin. In addition, customizable reports will allow our subscribers to track peak import/export months, compare trends over time, and perform their own analyses. Under the USDA National Organic Program, organic agriculture has seen long-term growth, both in terms of acreage under organic production, and in consumer demand. And yet, as American shoppers continue to seek out organic products in greater numbers, the gap between the volume of organic crops grown in the United States, and the demand for organic foods has been widening. That gap is largely filled by trade; that is, imports of organic crops. To gain an idea of the scope and scale of organic imports, Mercaris has analyzed U.S. Customs Data over the past year (July 1, 2012-June 30, 2013) for imports of corn, soybeans, and wheat. We also use harmonized tariff scheduling (HTS) codes and other shipping documents to compile data and crosscheck accuracy across publicly available and private databases. HTS is a systematic technique for classifying traded commodities throughout the world. While our analysis is still ongoing, and does not yet include imports that arrive in the U.S. via truck or rail, the initial data yields interesting results. 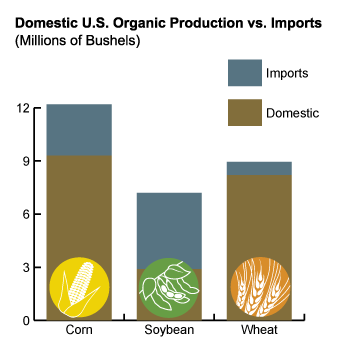 Our analysis shows that the U.S. imports account for about 23% of its organic corn supply, 60% of its organic soybean supply, and 8% of the organic wheat supply. Although yield numbers can vary dramatically, and organic acreage also changes over time, these numbers confirm that the U.S. is currently sourcing a significant amount of three major organic grain and oilseed crops from foreign sources. Organic grain markets are global in scope and as such will be influenced by forces outside of the borders of the U.S. While organic markets are still small compared with conventional markets, the organic supply chain is subject to some of the same currency, weather, transportation and other risks. This analysis indicates that there is room for domestic production to grow. There is a stated preference by many organic food and feed companies to source domestically, both to serve a consumer base that prefers locally sourced products for a variety of reasons, and to avoid higher fuel and freight costs. In the coming months, we’ll be expanding our coverage of organic trade data. These reports will be exclusively available to Mercaris subscribers. Our goal is to create customizable, accurate, and useful information for the organic & non-GMO community. Interested in our trade reports? Contact us! We would like to thank Kaila Tanksley, Summer Intern at Mercaris and Agricultural Economics student at North Carolina State A&T University, for her research and assistance in writing this article. This event is held every three years. The next World Congress is in Istanbul, Turkey in 2014, but the call for papers and presenters is open now! Visit the IFOAM website for more information. We will be attending the above events, contact us for more information.